Mel and Jeziel have been waiting for Christmas all year. For the presents? No. For the food? Nahh. For the time with family? Well kind of. But the thing they’ve been looking forward to the most is our awesome CHRISTMAS BOULDER BASH! Last year we hosted our Icy Cold Christmas at Cockburn Ice Arena, and it went wild! And this year is no different. 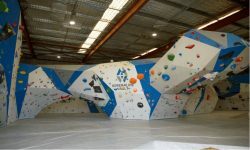 Mel and Jeziel will be hosting an amazing afternoon of bouldering fun at Adrenaline Vault! If you’ve never been bouldering before, it’s a form of rock climbing where you climb free from ropes, clipping, harnesses and belayers. All you need is a pair of climbing shoes and you’re ready to go! Climbers attempt “problems” one at a time on walls no higher than 4.5 metres. Don’t let the lack of ropes scare you. The low height and thick foam mats below mean that any fall is more fun than it is fearful. If you want to join us for our Christmas Boulder Bash, all you need to do is come on down the Adrenaline Vault in Belmont on Friday December 14. Mention 98five on the door and entry is on us! Plus you’ll get to see Mel and Jeziel broadcast live, with all your Friday favourites like Fusion Friday, Producer Diaries and Mel and Jeziel’s You Snooze You Lose What Happened in the Week News Review. Who: Mel, Jeziell and YOU!